The Clever Sheep: What's the Most Important thing You've Learned from Your PLN? What's the Most Important thing You've Learned from Your PLN? Tomorrow morning I'm taking a road trip to attend the ABEL Summer Institute where my session on Personal Learning Networks should dovetail nicely with the theme "Intersections: Where Learner, Literacy and Technology Meet." In my session, I'll be highlighting a number of online tools that educators and students can harness to develop learning relationships with colleagues around the world. To this end, it seems a natural segue for me to invite members of my own PLN to contribute to the session. For the benefit of attendees and others interested PLN development, my workshop materials are located here: The Golden Fleece Wiki, Teacher 2.0, HomePageStartup, Delicious, Google Reader, Twitter. Workshop attendees are invited to share their comments on the Social Networking for Teachers workshop by clicking the 'comment' button below. 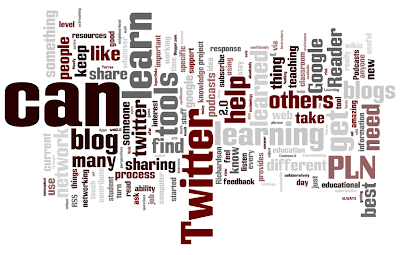 Image Credit: Wordle has been used to reframe PLN survey responses.